Julianne Swartz’s Loop, at first sight, resembles an extremely loose woven tapestry hanging on a wall and invokes a feeling of random or natural links. The black dots throughout appear to be dark circular blooms in the weave. Moving in closer to it you see it is made up of colorful cables or wires which are strung together to make its rectangular shape, making you realize these are not natural or necessarily random and that there is a technological aspect to the piece. The dark circles that initially appeared to be blooms, reveal they are actually small speakers on closer inspection and further add to the technological feel. Coming out of the speakers are sounds from life, such as water running, people shuffling, birds chirping, and children playing. These sounds connect us to memories and our daily lives and pulls the piece and our thoughts back toward nature. It appeals to our senses and also our emotions by reminding us of things that are important and represents the contact we have with nature and other people. Swartz’s Loop weaves together and connects like a web and the sounds and connections weave together a feeling of intimate emotions and associations. The piece represents that life is complicated and tangled similar to the wires and cables that make up the forms she creates. Society make up an intertwined framework or web that is connected at different points and these points are moments resembling the speakers you see. When we hear the real sounds, it reminds us of the important connections and junctures in our life and society. Another work by Julianne Swartz How Deep Is Your is a site-specific installation with sound that gives insight into just how far we might travel and go for love. 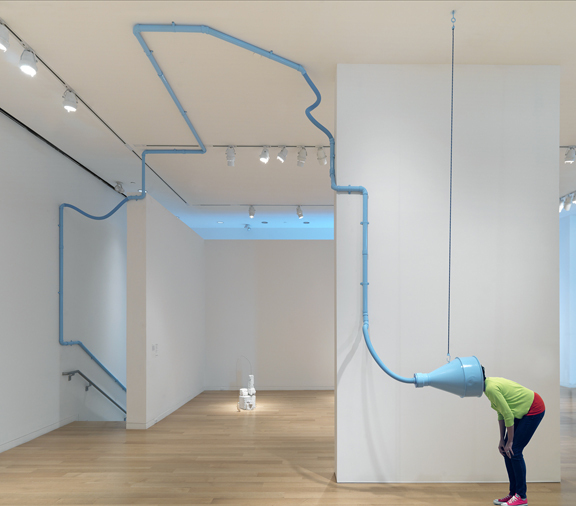 It is a blue tube winding through the museum for a total of 400 feet. As the tube flows around and up from the basement the songs How deep is your love by the Bee Gees and Love by John Lennon transmit out from a funnel which is located several floors up. Along the tubes route are breaks that the songs leak from similar to that of our path to find love and happiness. In the search for love and happiness we have temporary stops along the way but keep on moving towards our ultimate goal leaving pieces of ourselves behind. The light blue tubing contrast against the area it is twisting through similar to Loop’s colorful cables hanging on a white wall. They both twist around through their space but How Deep Is Your is very organized and orderly whereas Loop is chaotic and mixed up. They both exhibit how life can be, either straight forward and organized or mixed up and jumbled. Loop and How Deep Is Your show how easily sound can invoke memories and emotions within us. El Anatsui is a sculptor from West Africa. Duvor (communal cloth) by Anatsui is made of foil from around the necks of bottles and found objects strung together with copper wire. Duvor hangs on a wall much like a large tapestry but its framework is that of a solid form. It appears to incorporate the folds of something lighter, like paper, but at the same time appearing solid and stable. This type of opposing combination pushes you to dig deeper into its composition and wonder on the ability to display strength and flexibility simultaneously. Its pattern reminds me of a Gustav Klimt painting with its gold sheen and textured segments. Anatsui weaves together found objects similar to Julianne Swartz weaving together her cables and wires, both portraying connections we have we nature and each other. 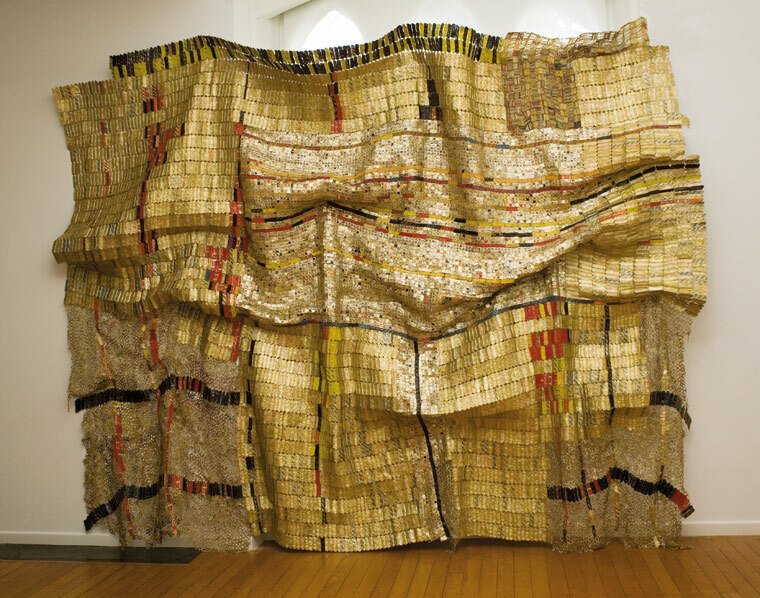 Swartz has spoken about how El Anatsui has influenced her. She stated she was struck by Duvor’s physicality and weight, how it hung on the wall and how it stretched the idea of what a tapestry was. She went on to create her sound tapestry Loop.